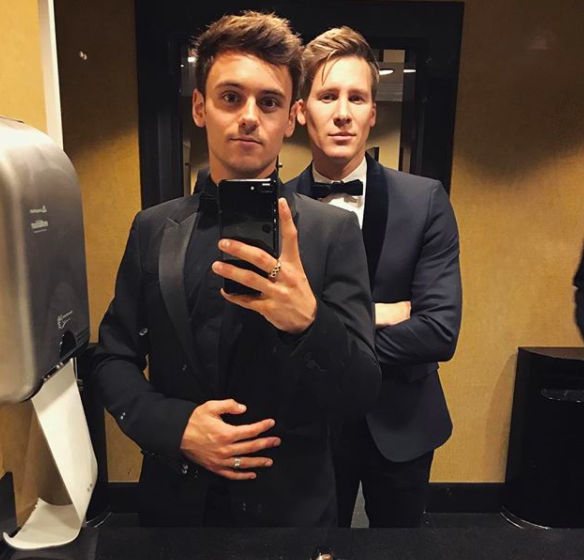 Diver Tom Daley and his husband Dustin Lance Black have announced that they are having a baby. The married couple shared similar photos on Instagram of the couple holding up a baby scan picture. Both posts are captioned with the message ‘A very happy #ValentinesDay from ours to yours’. A very happy #ValentinesDay from ours to yours. ?‍?‍? It is not clear when the two are expected to become dads but they will be welcoming their new arrival in the near future. 23-year-old Tom married 43-year-old filmmaker Dustin last year after becoming engaged in October 2015. Tom made the first move at an industry event by putting his mobile phone number into Dustin’s phone alongside a message asking the Oscar-winning writer to give him a call. The two shared the story of how they met with OUT Magazine last year. When Tom walked in I was, like, ‘Oh my God, he’s so cute’. I knew who he was — I’d watched the Olympics — but in person I found him more mature and confident than I had expected. He came in with this gaggle of beautiful women so I had no idea what his sexuality was. In fact, he seemed all loved up on this beautiful blonde, so I thought, ‘well, there you go’. But occasionally I would look over to my right and I would catch Tom looking at me — that split second when someone is looking at you before they realise they’ve been caught and look away. And I thought, That’s not straight. Dustin soon received more signs that Tom was interested but was still unsure what to think. And then my friend texted me from across the table, and his text said, ‘He’s Google-searching you’. Well don’t read into that too much. I do that occasionally at dinner tables. But that, in combination with the look, made me think, something’s up here, but that’s too good to be true. He can’t be into me. I’m dressed in a hoodie. Tom had just won an award at some Nickelodeon TV show, and they were planning to celebrate, and I said, ‘I’ve got to go home; I have a script to write’. And Tom took my phone, and he typed his number in with a winky face. At which point I felt I had confirmation that he was a gay. I’ve never in my life heard of a straight man putting his number in another man’s phone with a winky face. Soon enough the pair were speaking to each other ‘every day non-stop’ and they quickly became a couple. Tom admits that the couple were talking about marriage ‘within the first two weeks’ of their relationship as they already had ideas for the future. We were so busy making all these plans – we both wanted to have children; we both wanted to build a home of our own someday. I draw, so I was sketching little plans for houses on cliffs overlooking oceans, while Tom watched over my shoulder – it was a very grown-up version of playing house. Marriage is the foundation to all of these other big plans we have. So we knew we were going to get engaged — it was just a matter of when, and who does it. They then got married in May 2017.